Another variant, the Wilga 32, was an improved small series export variant with a Continental flat engine, produced also in Indonesia as the “Gelatik”. After producing 13 Wilga 3s, there were some improvements made, most notably a landing gear base increased from 2.12 m to 2.83 m to improve stability. An improved model, designated PZL-104 Wilga 35, first flew on 29 June 1967, subsequently entering mass production. The most numerous variant of Wilga 35 was the utility plane Wilga 35A, others were built in small numbers or remained prototypes. From 1979 the Wilga 80 went into production, an improved model certified for the US market. In the late 1990s the PZL-104MA Wilga 2000. For our full fiberglass kit, produced in modern glas and carbon fiber sandwich-vacuum technology, we can offer you all accessory parts from the scale rear landing gear , scale cockpit ,protective bags to GfK tank in field-tested quality. Furthermore we can deliver you all accessory- and scaleparts for your kit. Even in a completely ready to fly version you can get your model from us. This kit is already painted. Please contact us for different available color schemes. The Wilga is built full scale and has therefore accurate in every detail all rivet, hinged panels, panel lines and corrugated sheet on the finish recreateted in glass fiber technology. Even the slats along the entire length of the span are reproduced exactly as the original. It fits all standard engines under the bonnet and the Moki radial engine complements the sound of this beautiful towplane, which you can also get from us. In the air, the Wilga bribes with a stunning and unique flight pattern. On request we offer you our Model Building Service. You can individually agree with us how high the pre-production level should be. We can also built the model ready to fly. Please do not hesitate to contact us contact@tomahawk.gmbh. 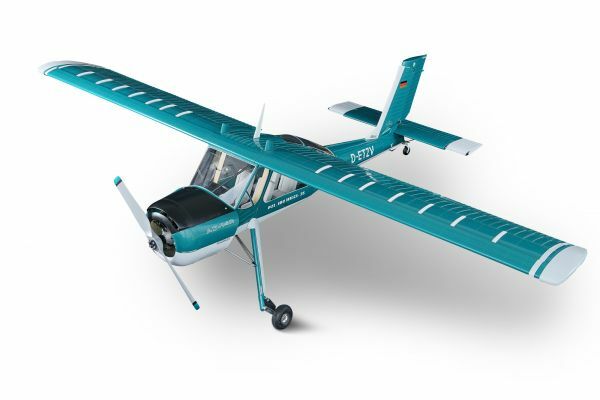 Related links to "Wilga 3,2m full composite kit painted"